Dwelling in Kashmir, Srinagar was established by the Mughals and is a beautiful creation with the conjugation of history and nature. This city is bounded by subsiding rivers and lakes that adorn the city with their beauty. The famous Dal lake and the lonely Nagin lake deserve special mention here. Srinagar tourism has all the facilities for the tourists so that they can rove in the divine beauty peacefully.Srinagar shows the royalty of the mughal through the architectural heritage of the houses banked on the Jhelum river adjoined with the byzantine alleys. 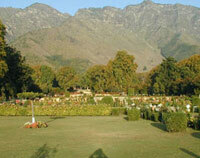 Srinagar change its colour in every season and dresses up in a seasonal beauty. 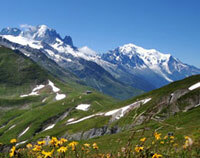 In winter it is snow-bounded and the chilled weather makes it more attractive. In spring and summer the city dresses up with variety flowers as the snow melts and the trees also take a new shape. Snow melts from the rooftops of the houses and they turn into a flower cascade. Houseboats in Kashmir are one of the major Srinagar attractions. These houseboats are the living boats or hotels which are anchored on the Dal lake or the solitary waters of the Nagin lake. These houseboats are built with utter comforts and luxury. Beautifully carved furniture adorn the rooms with the kashmiri carpets decorating the floors. The owners of the houseboats lives on a separate houseboat adjacent to it so that they can deliver their service to the guests quickly. You can can have a round of the lakes with the rhythmic waters on the well cushioned Shikaras or the tiny boats. Spending holidays on the Shikaras are one of the most exotic and romantic experience. 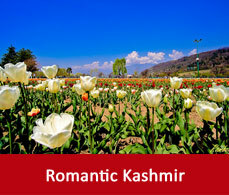 Kashmir is also a called a honeymooner’s destination Government of Kashmir charges different tariffs on the various houseboat packages of Kashmir depending on the facilities they offer. 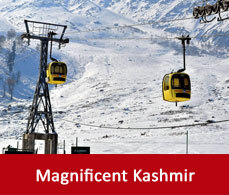 Srinagar displays in front of you various tourist spots which will leave a mark in your heart. Capture the beauties of Srinagar with your eyes and make your holidays a remembering chapter of your life. 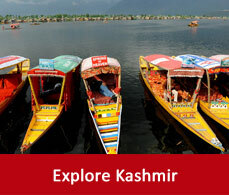 Srinagar sightseeing will give you scope to explore some of the mesmerising places of the world. Like the Mughal gardens, Dal lake, Nagin lake, Jama Masjid, Hari Parbat there are other tourist spots in Srinagar as well.